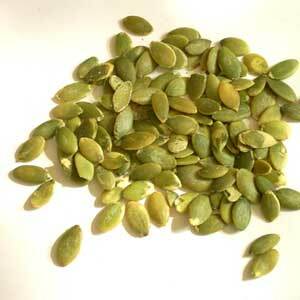 Pumpkin seeds are a good source of essential fats, zinc and protein – all are important for male and female fertility. They make a handy snack to carry with you to combat that afternoon slump or to munch on after sporting activities. Pumpkin seed butter is delicious spread on wholegrain crackers, my flaxseed bread or on your toast at breakfast. It’s much cheaper to make your own than to buy it. You can also make a pesto from this recipe by blending in some spring onions, garlic and coriander. If you have seeds as one of your Metabolic Balance breakfast choices, you could make a batch of this pumpkin seed butter (from phase 3) , or make it from a mixture of sunflower and pumpkin seeds. Here’s an easy recipe. You’ll need a seed or coffee grinder. Grind the seeds to a fine powder. Gradually stir in olive oil one teaspoon at a time (you’ll need about 1 tablespoon) until the butter is of a creamy consistency but not runny. Add some sea salt to taste. Keep in a sealed glass jar in the fridge. It should keep for up to a week. Tip! Transform this recipe into a pesto by blending in some finely chopped spring onion, garlic and fresh coriander.